Early stages of grading for the new road alignment, January 4, 2016. 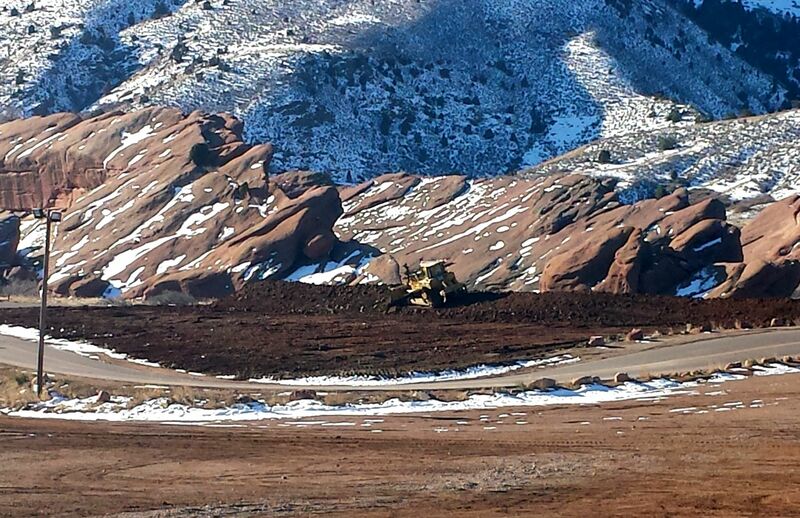 On the first business day of the new year, heavy equipment started rolling at Red Rocks Park. Several changes had been proposed and discussed in months previous, and Denver Arts & Venues was moving forward. The Upper North Parking Lot was to be paved and reconfigured, the intersection of Alameda Parkway and Trading Post Road would be revised, and Red Rocks Park Road between the Lower South lots was to be straightened to accommodate additional parking. Representatives from the historic preservation community were particularly critical of this realignment of one of the last historic road segments of the park road system, especially in light of the recent designation of the Park as a National Historic Landmark. The road system is a “contributing feature” to the historic designation, one of the key elements that indicated its qualifications for designation as Colorado’s newest national landmark. 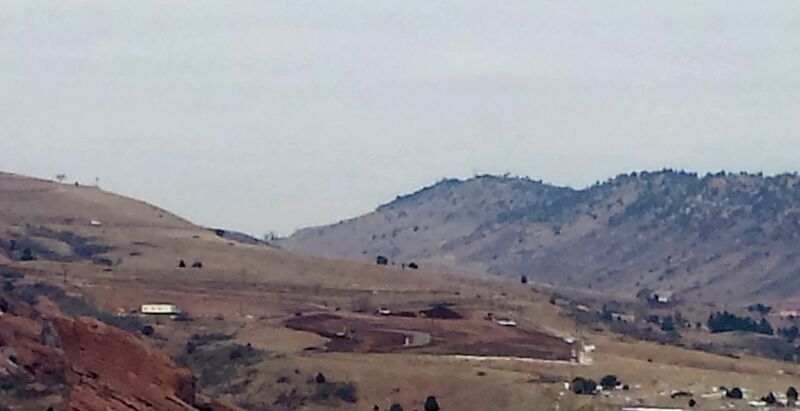 By January 5, 2016, significant progress was made in removing native vegetation and outlining the new road. On only the second day of work, January 5, the new road was taking shape. By January 22, grading of the new parking area was underway, and work on the intersection to the north was clearly visible as well. The Icelantic “Winter on the Rocks” event took place on January 29th. By that time, the new road was graveled as was the entire parking lot. 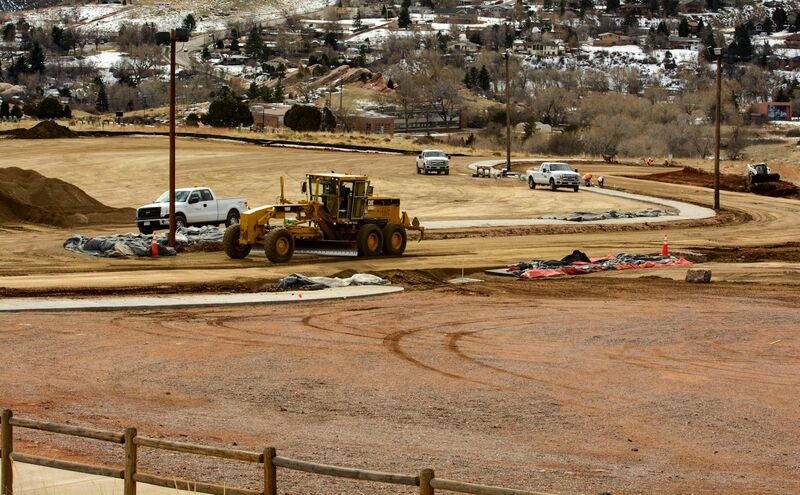 By February 11, the road and parking lot were graveled and sidewalks were in. Cutbanks for the northern intersection were covered with landscape fabric. Closer view on February 11 shows work underway in preparation for paving, which was completed a day or two later. 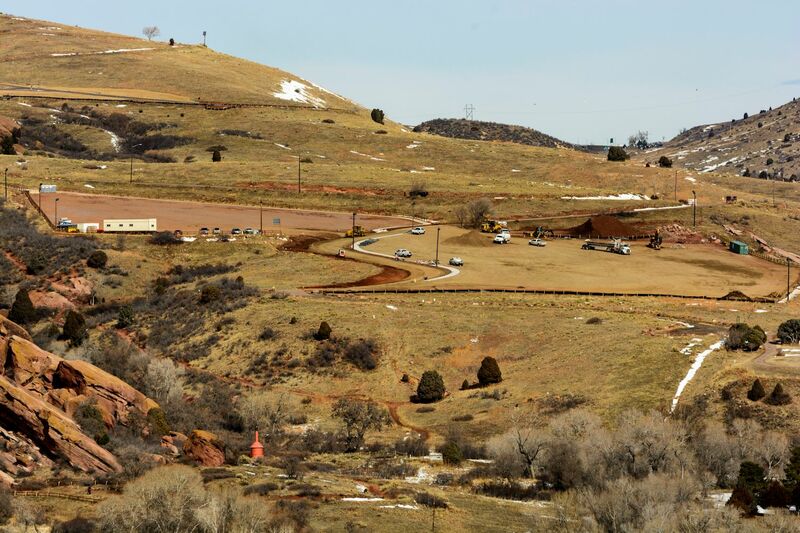 Despite repeated recommendations from the historic preservation community, Secretary of Interior standards for the treatment of cultural landscapes do not appear to have been followed for this project. 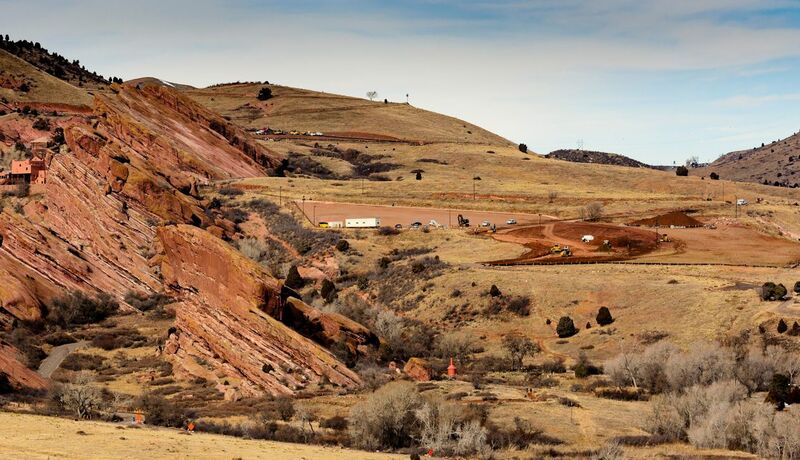 Although the National Park Service and the Denver Landmark Preservation Commission reviewed the project early in 2015, neither agency had jurisdiction to require adaptation of the project or consideration of alternatives. 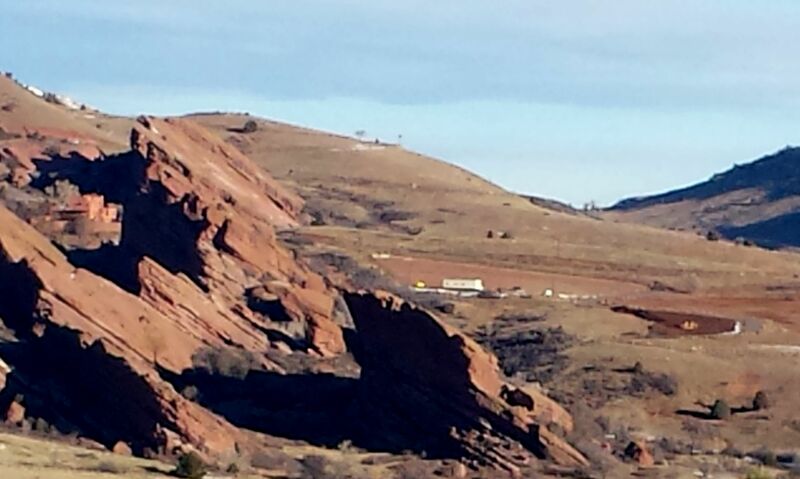 Denver Arts & Venues was free to proceed, at the expense of one of Red Rocks Park’s significant historical features. This entry was posted in developments by mountainparks. Bookmark the permalink.